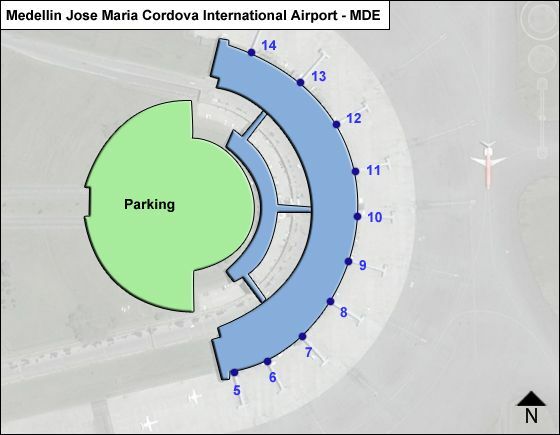 The modern passenger terminal at Medellin J. M. Cordova Airport has been continuously upgraded and expanded and includes 11 boarding bridges. It offers all the basic services and amenities, including food & drink, retail & duty-free concessions, banks, ATMs, currrency exchange & rental car desks, along with a beefed-up security system. Information points are placed in arrivals & departures areas. Ongoing work in the terminal involves the expansion of domestic & international areas by 9,494 sq.meters (icluding new boarding bridges (2 at domestic, 3 at international departures), and renovation covering 2,750 sq.meters. Improvements are also ongoing in the Central Hall, and the satellite connection for transit passengers. Note: No completion date is available and some work may have already been completed.